The New York Times reports that a new uranium-thorium dating technique determined the paintings in El Castillo, a cave in Spain, to be at least 40,800 years old — 4,000 years older than what was previously thought to be the oldest human art, the paintings in the Chauvet Cave, France. Maybe I have an overactive imagination, but from this photo it looks to me like hands reaching out of a hole in the wall. If so, these cave paintings are a lot more sophisticated and theatrical than banal hand prints — and much more in keeping with what we know about cave paintings. 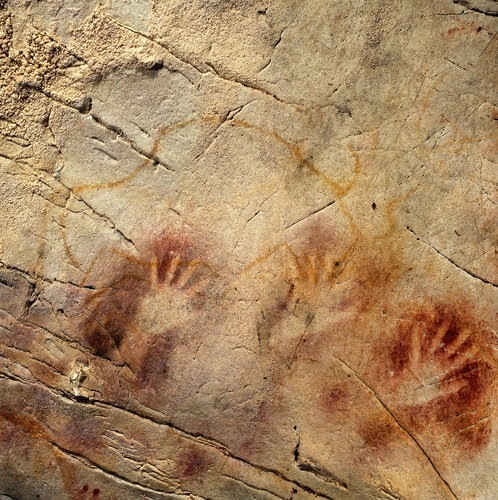 40,000 year-old hand stencils, El Castillo Cave, Spain. In the last three years, Chinese archaeologists have unearthed 110 new terracotta warriors, 12 pottery horses, parts of chariots, weapons and tools near the Qin Emperor's mausoleum in China's northern Xi'an city. They may be some 38,000 years younger than the El Castillo cave paintings, but they’re still pretty old (221-206 BC) and are well-preserved and colorful. You can see more photos here. 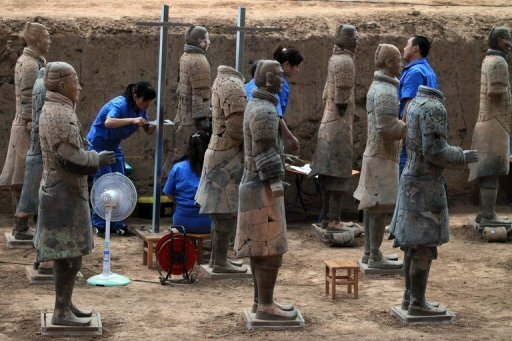 Chinese archeologists working on terracotta warriors in Xi'an, China, June 9, 2012. There are at least two websites that I know of devoted to documenting the fast-disappearing neon signs of New York: Thomas Rinaldi’s blog New York Neon takes an historic approach, and Kirsten Hively’s Project Neon! is more slanted to art. Both are beautiful and comprehensive. Colony Music (animated), Broadway at 49th Street, New York City ( Photo from Project Neon!). 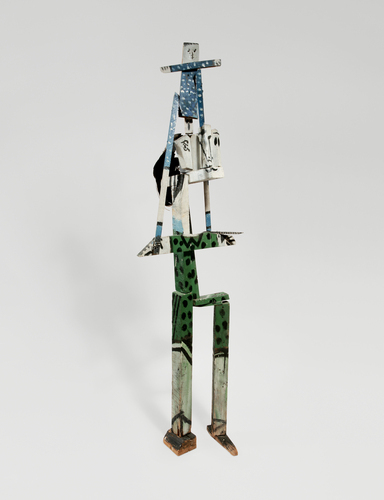 The Gagosian Gallery's exhibition Picasso and Francoise Gilot: Paris-Vallauris 1943 - 1953 has more than 100 paintings, drawings, prints and photographs, but I was especially excited by the sculpture and ceramics (I'd estimate about 50 of them). 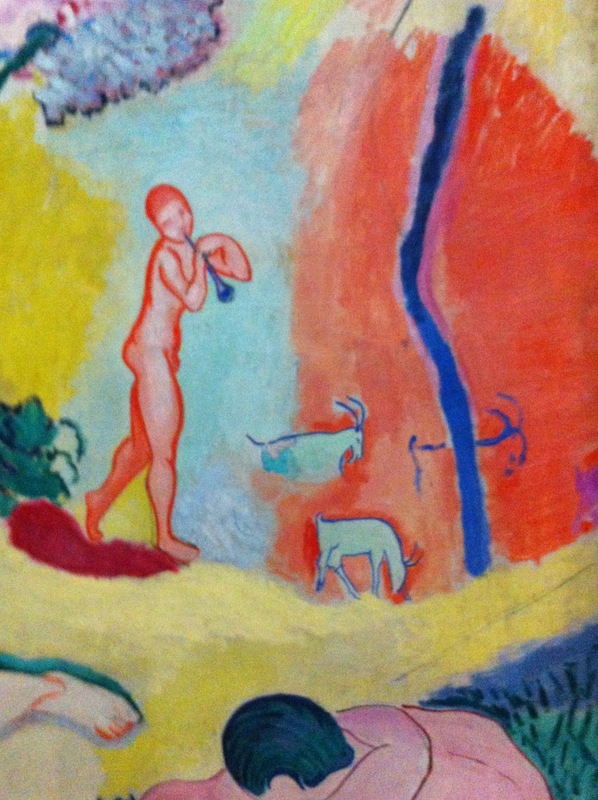 They look like the work of four or five great artists instead of work spanning ten years by just one person! 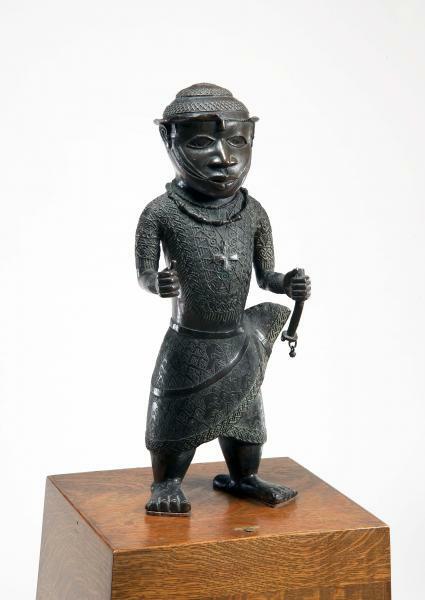 The show closes June 30th — DON'T MISS IT! 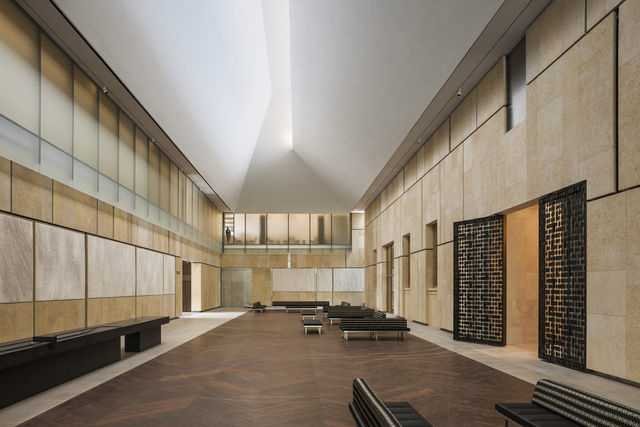 The Gagosian Gallery, 980 Madison Avenue at 77th Street. 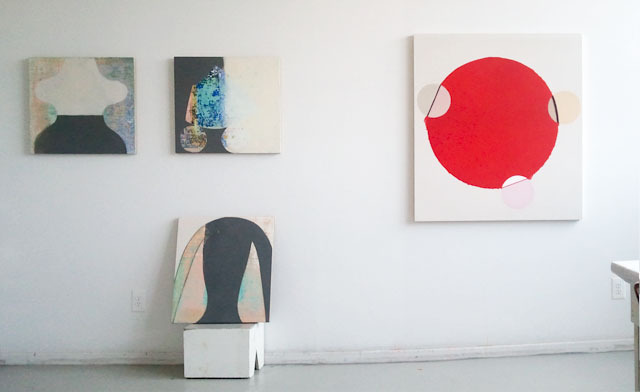 Installation view, Material Tak; paintings by Jsun Laliberté on the left, and Anne Sherwood Pundyk on the right. Almost everything that’s now happening with abstract painting is represented in this handsome exhibition located in what used to be the Warehouse District of Jersey City. The exhibition was curated and sensitively installed by Kara Rooney, who has brought some life into the moribund art scene here. 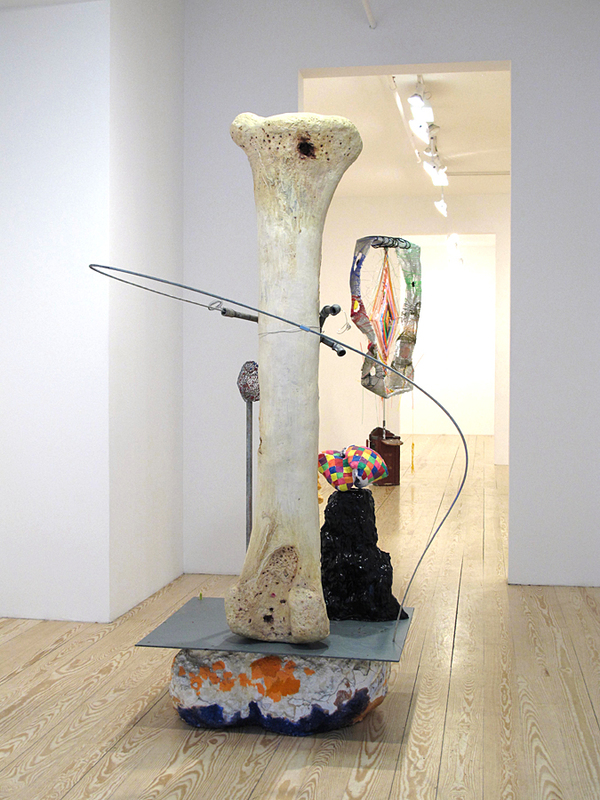 The artists in the exhibition, Mark Dagley, Anne Sherwood Pundyk, Kati Vilim, Jsun Laliberté, and Peter Fox, are from Manhattan, Brooklyn and Jersey City; and all their work is accomplished and complex (in a good way). Anne Sherwood Pundyk, Levels, 2012, acrylic and oil on panel, 14 x 11 inches (not including the painted background). I was particularly interested in Anne Sherwood Pundyk’s installation. 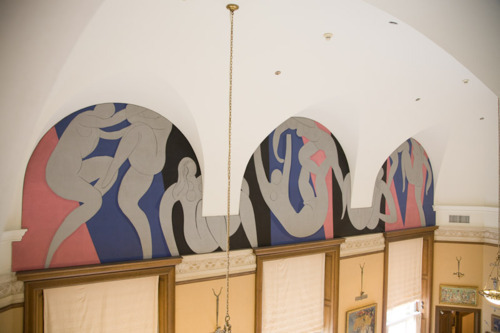 By creating a wallpaper-like background for her paintings, Pundyk transformed this large, Chelsea-style space into a congenial environment — a more private, almost residential, space that allows you to slowly savor this rich work. 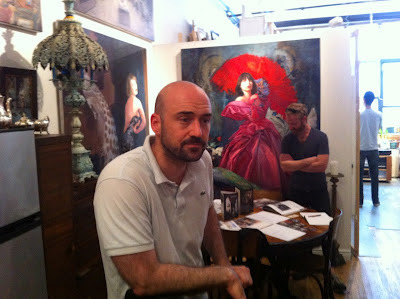 Two of my favorite Jersey City artists currently have exhibitions on view. 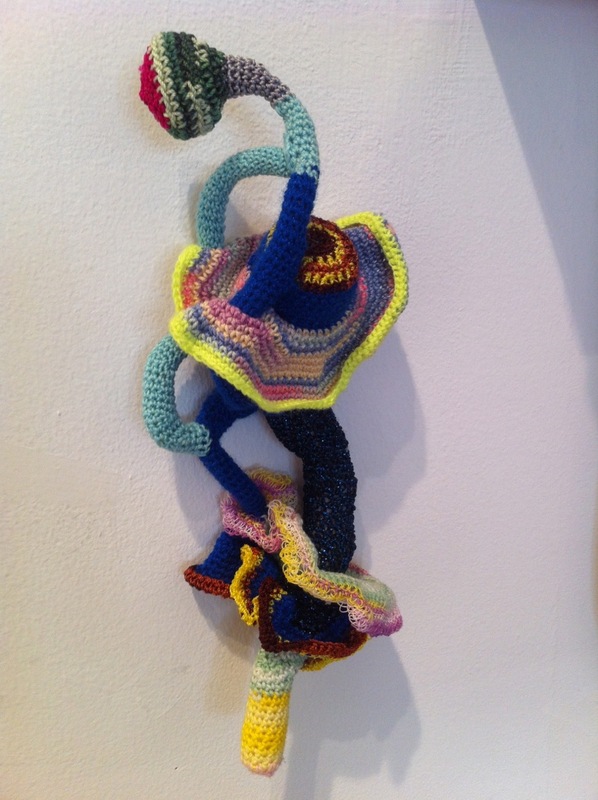 Nancy Cohen, whom I wrote about here, is in two shows: Accola Griefen Gallery, 547 W. 27th St #634 in Chelsea (until June 23rd), and Precarious Exchange at The Hunterdon Art Museum, 7 Lower Center Street, Clinton, NJ (until September 9th). 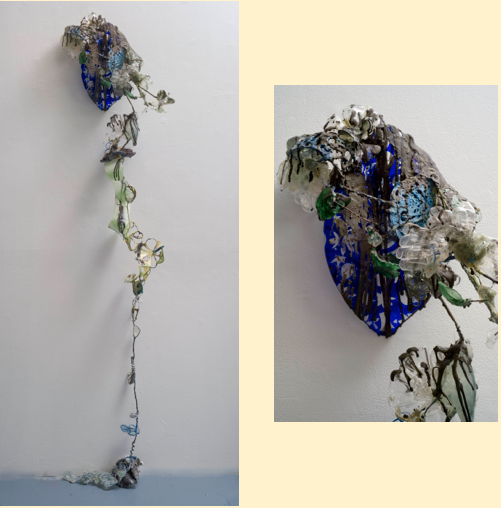 Nancy Cohen, Spill, 2011, glass, metal, wire, resin, handmade paper, wool, 77" x 16" x 9" -- and detail on the right (Accola Griefen Gallery). And Edward Fausty will be showing photographs at the Mayson Gallery, 254 Broome Street on the Lower East Side, from June 13th until July 18th. 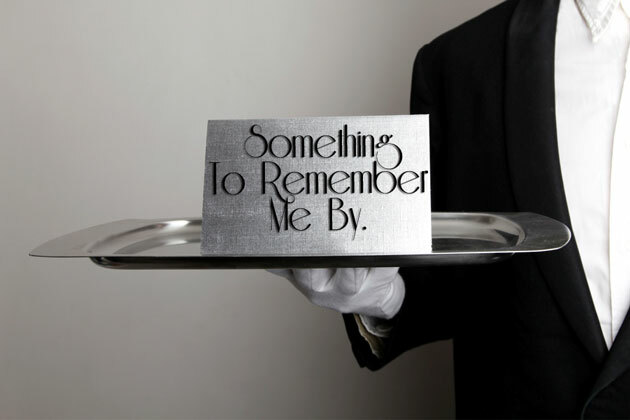 Art House Productions, one of the most active and vital cultural organizations in Jersey City, is presenting the original play Something to Remember Me By from June 14 - 23. 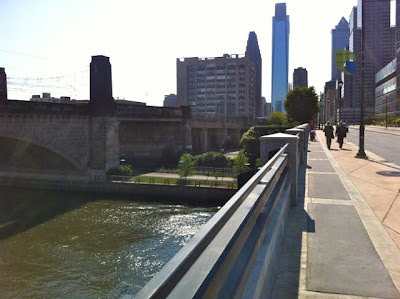 It should be a real treat; their publicity states: ... Please join us at the Morris estate where your hostess, Ms Abigail Morris, will welcome her closest family and friends for an evening of celebration and forgiveness. ON THE MENU: An assortment of sweet memories, bitter grudges, and dark secrets. The audience will be sitting at the dining room table with the cast. Tickets are only $15 to $25 and you can buy them online here. After their Saturday, June 23rd show, Art House will have their annual Summer Blowout, with live music, food, raffles and all kinds of silly fun. Tickets are $10. If you took my advice and went to the Nimbus Dance Works Spring Season Dance Concert, you saw an enthralling performance that included new pieces by Artistic Director and Founder Samuel Pott, and by the Turkish choreographer Korhan Basaran. Hopefully next year Nimbus will install steeper risers so everyone will be able to see better. You can find photos of the concert here, on their Facebook page. 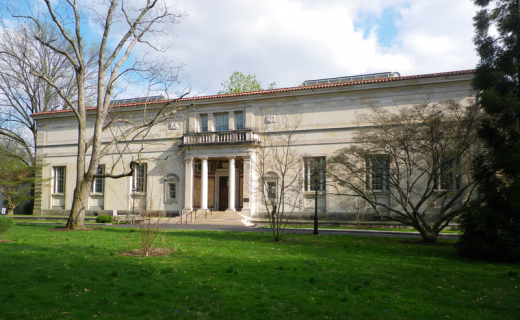 The Corcoran Gallery of Art in Washington, DC may sell its landmark building. Art blogger Tyler Green has been on this potentially scandalous story. The good Corcoran news is, beginning June 30th they will be presenting a retrospective of Richard Diebenkorn's Ocean Park series of paintings. It is a major show consisting of more than 80 paintings, drawings and mixed-media works that Diebenkorn made from 1967 to 1988. 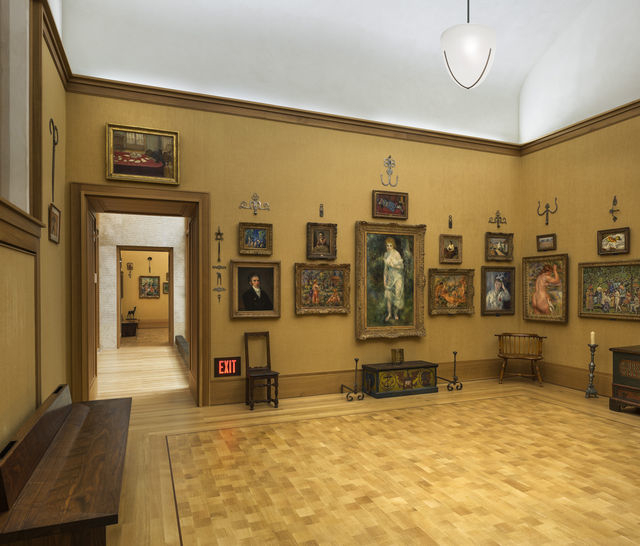 The Corcoran is the only place this travelling exhibition is going to on the East Coast. It will be there until September 23rd. 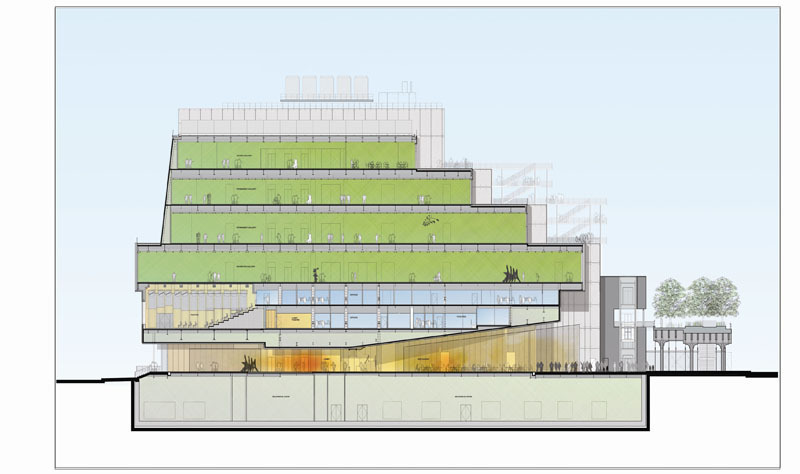 The Whitney Museum sent out an email updating the progress on its new museum near the High Line. Here's a video about it. 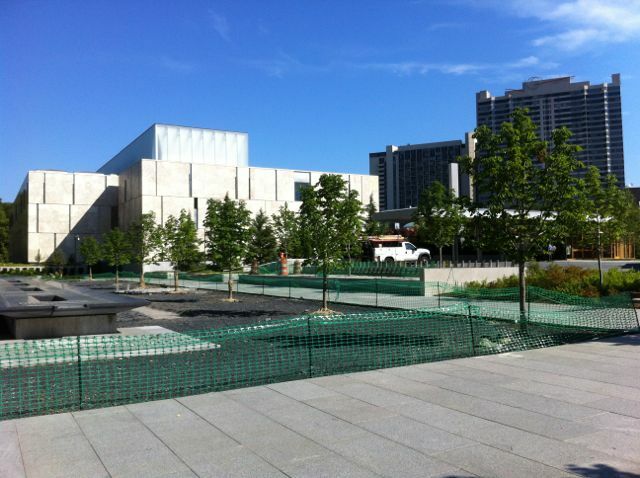 The New Whitney - Image courtesy of Renzo Piano Building Workshop in collaboration with Cooper, Robertson and Partners. They are saying the new 200,000+ square foot facility will have three times the space as the old museum devoted to exhibiting their permanent collection; a 170-seat theater with double-height views of the Hudson River; a 13,000+ square foot space on a stepped roof facing the High Line for outdoor sculptures, installations, new media, and performance presentations; and an 18,000+ square foot special exhibition gallery— the largest column-free art museum gallery in NYC. Sounds good. The New York Times reports on Dia: Chelsea's plans for a new building in Chelsea. 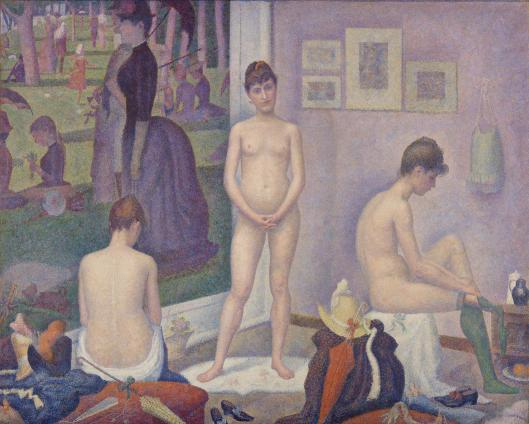 Also from the Times is this: How the Art Market Thrives on Inequality. 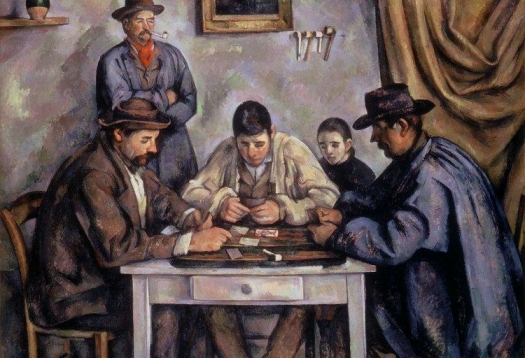 Because each piece of fine art is unique and can’t be owned by anybody else, it does a more powerful and subtle job of signaling wealth than virtually any other luxury good. High prices are, quite literally, central to the signal — you don’t spend $120 million to show that you’re a savvy investor who’s hoping to flip a Munch for $130 million. You’re spending $120 million, in part, to show that you can blow $120 million on something that can’t possibly be worth that much in any marketplace. Pacific Standard Time (PST) is a series of more than 60 exhibitions about the art history of Southern California that the Getty Foundation and the Getty Research Institute instigated. Once again they have shown leadership by putting their entire PST archives online. 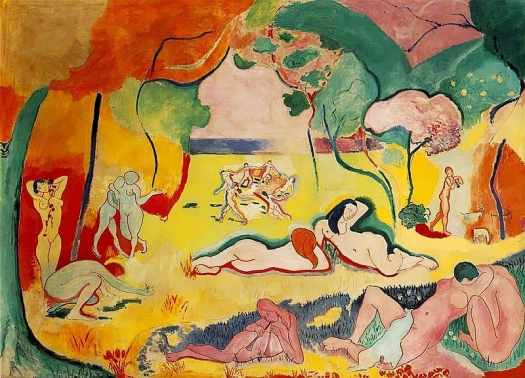 Not only that, but the Los Angeles Times reports the Getty Research Institute, partnering with several other major art institutions, has created The Getty Research Portal, an art history version of Google Books with about 20,000 titles already online and much more to come. What a resource! Brice Marden's new paintings at Matthew Marks, 526 West 22nd Street, are small and tactile. Delicious work. 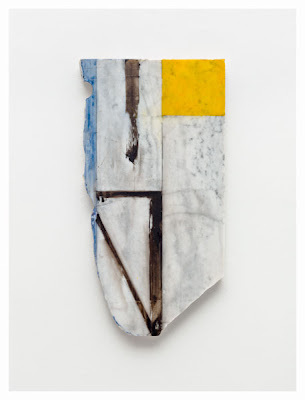 Brice Marden, Years 2, 2011, oil and graphite on marble, 21 ¼ x 11 ¼ inches. And yet another sign of the positive influence of Richard Tuttle that I wrote about here is the work of Michelle Segre, Derek Eller gallery, 615 West 27th Street. Michelle Segre, Let Me Love Your Brain, 1997-2011, mixed media, 83 x 69 x 41 inches. And finally, From Dance Magazine, is a discussion with six choreographers about making work for film. BOS 2012 — Bogart Street. 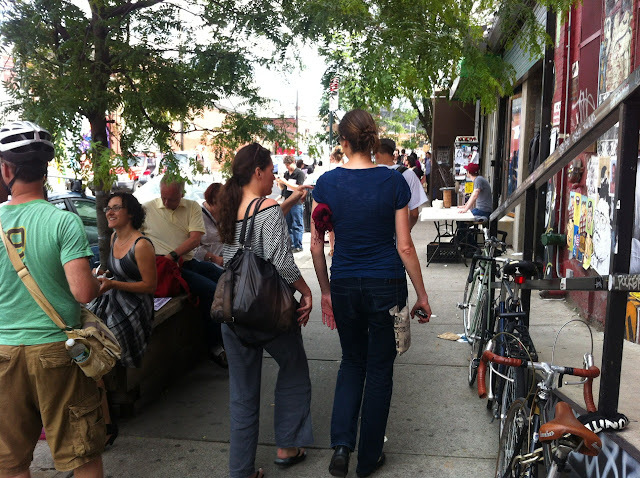 BOS 2012 was a BIG studio tour — more than 500 artists, plus dozens of events including dance concerts, performances, plays, rock concerts and parties, all of it spread out over three square miles from east Williamsburg to Ridgewood Queens. And there was a lot of good art, some very good indeed. 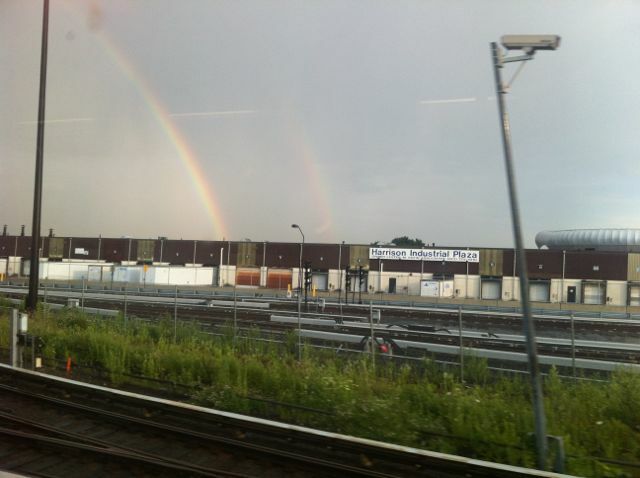 That plus great weather (it seems the few times there was a brief rain shower I was inside!) and plenty of pleasant places to stop along the way to have a beer or coffee and rest up, made this one of the best studio tours I've ever gone to. But the main reason I loved this tour, and I’ve written about this before, has to do with the spirit of collegiality in Bushwick. There’s a welcoming camaraderie that pervades the area — and it’s not the affected peace-and-love phoniness of the sixties. Rather it’s unpretentious and sincere — very different from the ironic cynicism that has been so prominent in the big-money art scene of the last decade or so. But even the iPhone app wasn't enough for an event this massive. 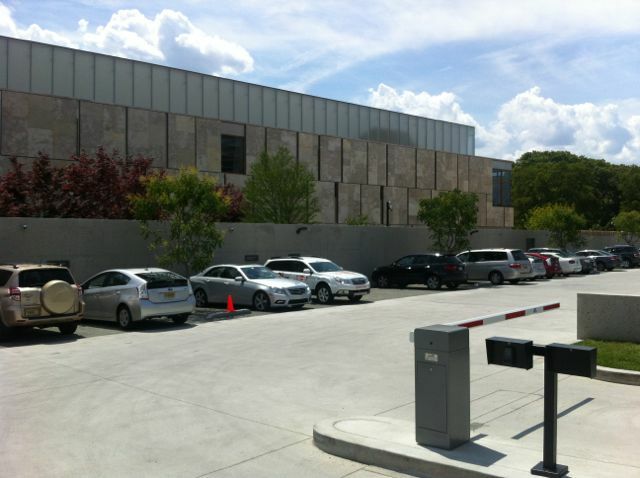 According to people I talked to that were part of the tour, and my own observations, most people only went to the larger studio buildings like 56 Bogart and 1717 Troutman. It's too bad because they missed some good venues like 250 Moore Street where the Centotto gallery and the artist Tim Kent are located. I'm sure I missed plenty of good stuff. On Friday night, kick-off night, there were several gallery openings and parties, most of which went on until 2:00 or 3:00 in the morning -- I pooped out by 11:00. 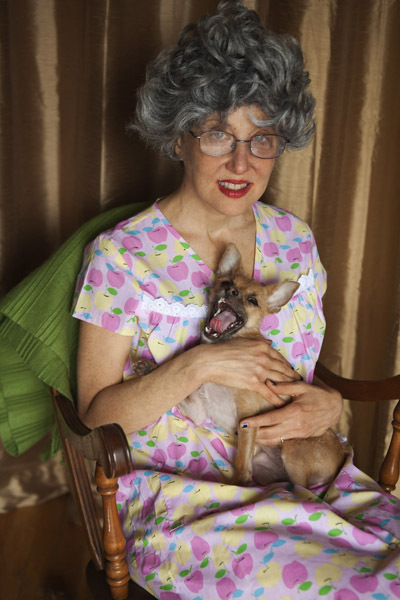 That night I did go to the Bushwick Starr's fifth annual performance showcase — The Bushwhack Series. The Bushwick Starr executive director Sue Kessler (no relation), and Noel Allain, artistic director (Photo - Jared Klein, Time Out). 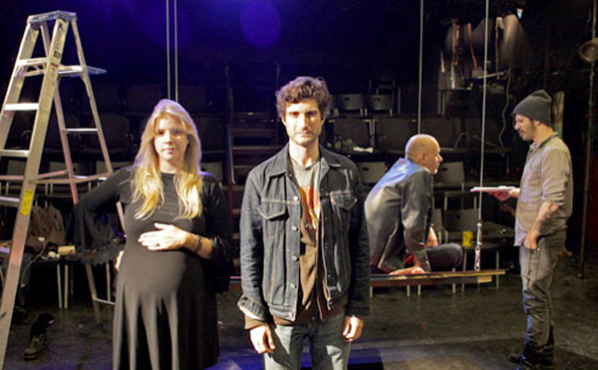 The Bushwick Starr, 207 Starr Street, is a professional theater group that produces cutting-edge original theater in a small (about 50-60 seats), well-equipped black box theater. They did a series of short, well-acted plays. Unfortunately there were only about 20 people in the audience when I went, maybe because of all the other competing events, but, according to Jason Andrew who has produced many events, this is par for the course. That's the one disappointment I have with the Bushwick art scene -- there is little or no interaction with, or even much support for, the other arts. I long for the way it used to be in the sixties and seventies in New York. I hope it will change. Maybe something is happening even now. The tour started off promising. In front of 56 Bogart, Lisa Levy, costumed in a gray wig, house dress and large eyeglasses, sat in a rocking chair and offered to comfort people. After reassuring me that I wouldn’t crush her if I sat in her lap, Levy rocked and hugged me. ... It was wonderful. I loved it! I could have used it again at the end of the day, but she was gone by then. Oliver Warden, Untitled Box, 2010 Photos by Jo Jo Phong. Inside the lobby at the entrance to the always interesting Agape Gallery was a very different kind of performance: Oliver Warden’s Untitled Box 2.0, 2010. Warden, in an amazing feat of endurance, stayed in a two-way mirrored box for two seven-hour days (correction - see comments). When someone flicked the switch, a light would turn on in the box, revealing Warden standing there unsmiling in a suit and tie. He immediately shut the light off again so that just the mirror was visible. The effect was creepy, and every once in a while, as you wandered the floor, you'd hear someone to shriek and laugh. 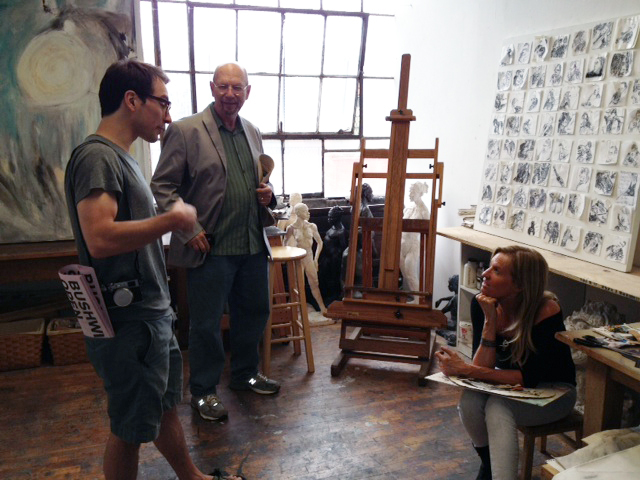 Charles Schultz and Charles Kessler at Cynthia Sparrenberger's studio, 56 Bogart (photo: Anne Sherwood Pundyk). Yet a third kind of performance took place at The Bogart Salon, 56 Bogart. It was the filming of ISHA: A Tell All Tale, a wild and colorful Bollywood-style soap opera. Viewers were invited to participate if they wanted to. Kesting/Ray opened a small space (bigger than their current space in Soho, however) only a couple of blocks west of 56 Bogart, but since everything else is east of 56 Bogart, I fear they might still be off the beaten track. I hope not because it's a beautifully proportioned space with lots of natural light, and they're showing good work. 1717 Troutman is a huge loft building that had 32 studios and two galleries, Regina Rex and Parallel, on the tour. At 1717 Troutman for some reason -- maybe I was overwhelmed by it all -- only the two gallery exhibitions Regina Rex and Parallel stood out for me. 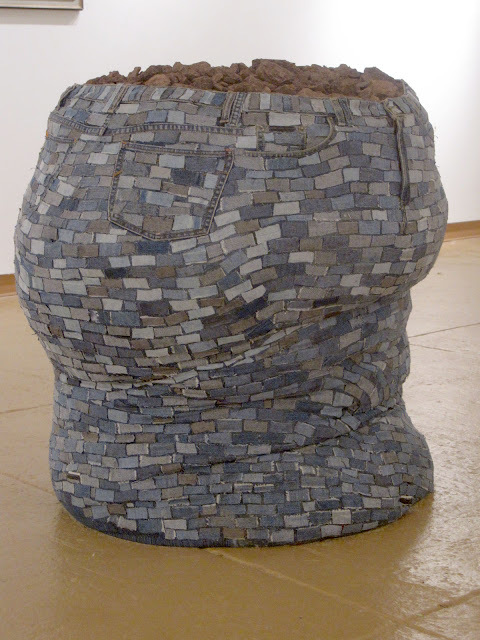 Jennie Shanker, Brick Shithouse, 2011, denim, sand and red shale, 36 x 36 x 36 inches (Airplane Gallery). 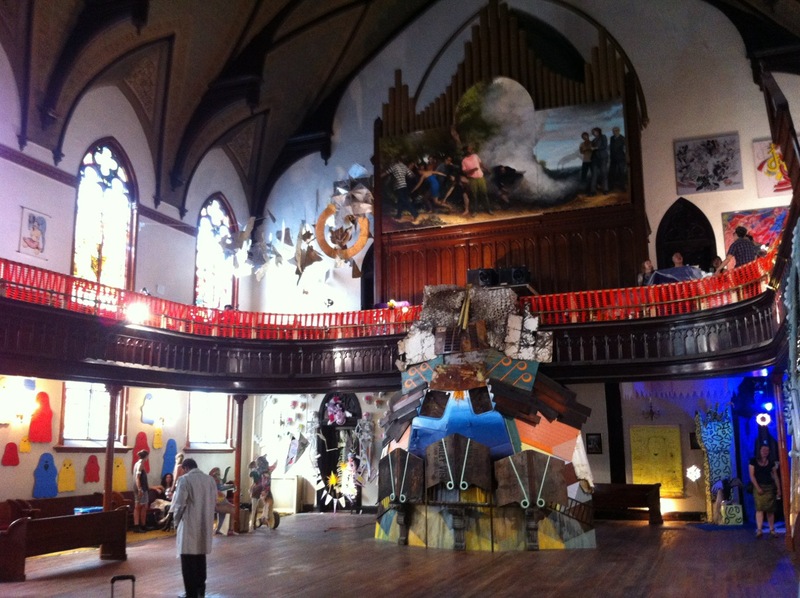 One of the better and bigger group shows was Holy BOS, a two-day, three-night music, film, video, performance and visual art festival in a former church. The space was large enough to hold large, almost environmental sculptures. Holy BOS at the Bobby Redd Project Space, 626 Bushwick Ave. 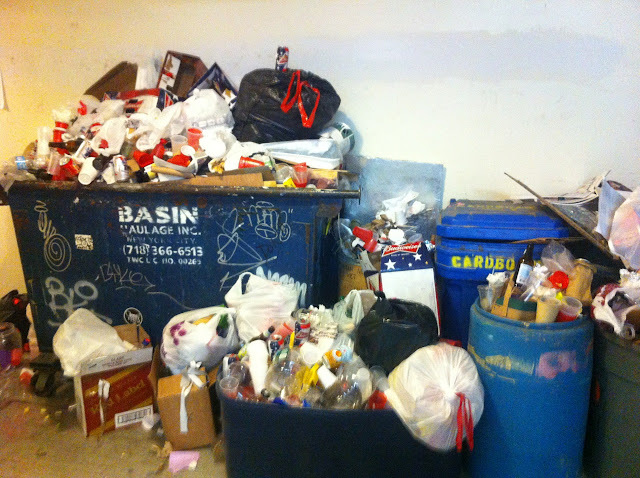 This isn't an art installation, it's a hallway at 56 Bogart at the end of day one. Sunday I was the designated guide for several friends, and while that slowed things down to the slowest person at any one time, an event like this is a social occasion too - it’s not all business even for a compulsive art blogger. And the pleasure my friends had, their delight and enthusiasm, was more than enough to make up for missing a few spaces. One would think that by the second day, especially in the more heavily trafficked spaces, the artists wouldn't be all that friendly. They were definitely exhausted, but they were still gracious, and happy that people came by, and pleased to talk about their work. We had some lively and enthusiastic discussions. A new gallery, Ethan Pettit Contemporary, moved to a very small space in a building with many art studios, 199 Ingraham Street. They promise to keep regular hours (noon - 7:00, Thursday thru Saturday). 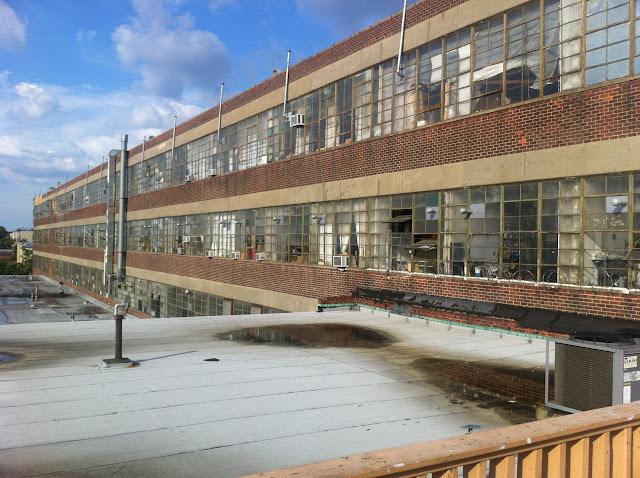 I saw a lot of sculpture in that building, and I particularly liked the work by studio-mates Jeanne Tremel and Eliot Markell because of the way they manage to incorporate color without making the sculptures seem to be weightless or hollow. Jeanne Tremel, Not Listenin' (front view), 2008, crochet thread 11 x 4 x 3 inches. 117 Grattan Street is yet another large loft building, and this had a lot of art I liked. Sharon Butler of the excellent blog Two Coats of Paint just moved there and organized a small group show that included a few nice small paintings by Larry Greenberg of the Studio10 gallery. 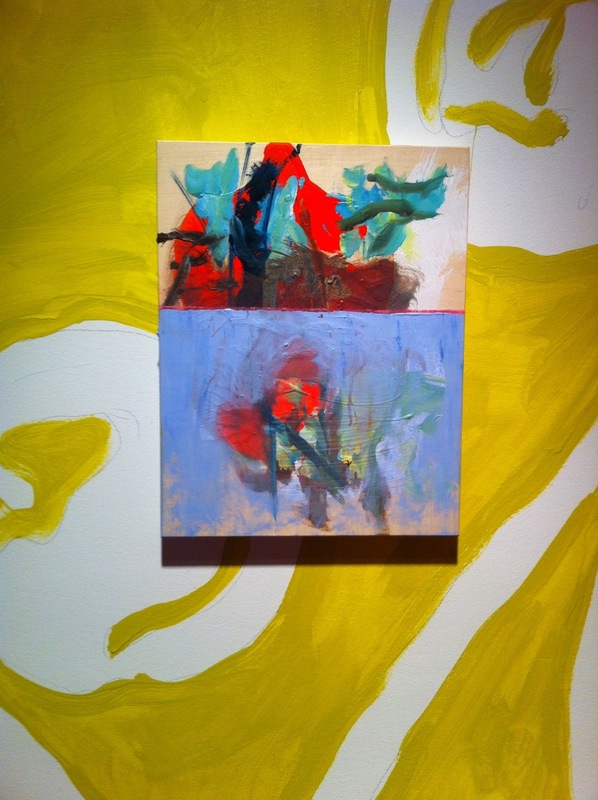 And Patricia Satterlee's paintings, in another studio in 117 Grattan, were rich, complicated semi-abstractions that kept me off-balance with unexpected and quirky images. I asked her what she thought of Tom Nozkowski's work since I saw a relationship there. 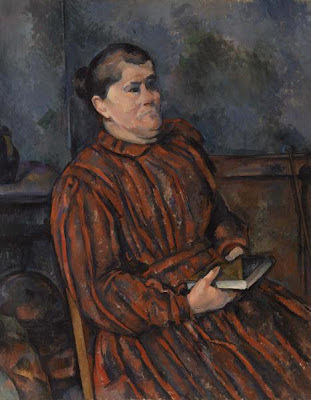 Rather than becoming defensive, she said she loved Nozkowski's work and was delighted I thought there was a connection. This mature and sophisticated reaction was typical of the many other Bushwick artists I talked to about their work and is indicative of what I see as a favorable change in the ethos of the art world. Patricia Satterlee's Studio, 117 Grattan - “Gloria” series of paintings. One of the last things I saw, the Bushwick Basel art fair, encapsulated a lot of my feelings about Bushwick. Bushwick Basel at Starr Space (Photo Alissa Guzman via Hyperallergic). 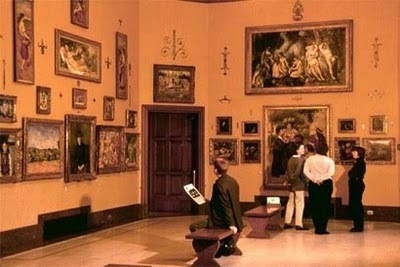 First of all, the art was first-rate, and it was presented in an intimate and sociable environment. 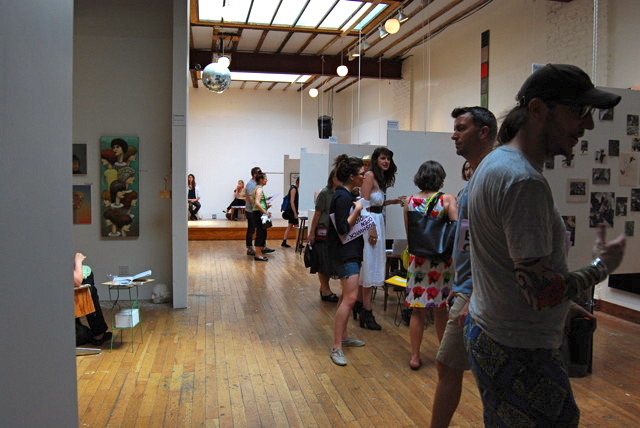 In a generous gesture to the community, Jules de Balincourt, one of Bushwick's most successful artists, organized the fair and donated his space. He told Paddy Johnson, “You know, I’ve been lucky and some of my friends haven’t been. I want to do something good.” That speaks to the supportiveness and camaraderie I've noticed in Bushwick, but there was something else. When Balincourt first announced the fair, he indicated that it was a kind of spoof or parody on art fairs, and he got some good-natured push-back for that remark. Clearly people were uneasy with irony, almost embarrassed; in Bushwick now, they are more comfortable with straightforward sincerity.